Atypical melanocytic lesions are also known as atypical melanocytic hyperplasia, atypical mole, or dysplastic mole. The majority of these are benign, however, some have a significant risk of developing into melanoma or actually being a melanoma. This terminology is applied based on either a visual inspection or a biopsy of the lesion. These are indicators for a biopsy to rule out melanoma. Atypical melanocytic lesions are pigmented moles that have been found to have abnormal cells and are assumed to be at risk for developing into a malignant melanoma. These lesions, once diagnosed as atypical, are typically excised to eliminate the risk of cancer. Although this seems like a prudent approach, scientific evidence for this is frequently lacking. Rationale for excision is based on clinical standards for treating melanoma-in-situ or lentigo maligna. Most pathologists regard mild and moderate atypia synonymously. Only melanoma-in-situ has adequate evidence to support surgical excision. This particular lesion carries a 5-10% risk of degenerating into malignant melanoma over a 50 year lifetime. This breaks down to a risk of 1-2% per decade. What no one knows is the risk of the atypical melanocytic lesions. Logic would dictate that the risk would be even lower - if present at all. The complete diagnosis of a melanocytic lesion requires a complete excision. These lesions frequently exhibit heterogeneity - variability of abnormality. In other words a lesion with moderate atypia may contain areas of melanoma-in-situ within it. 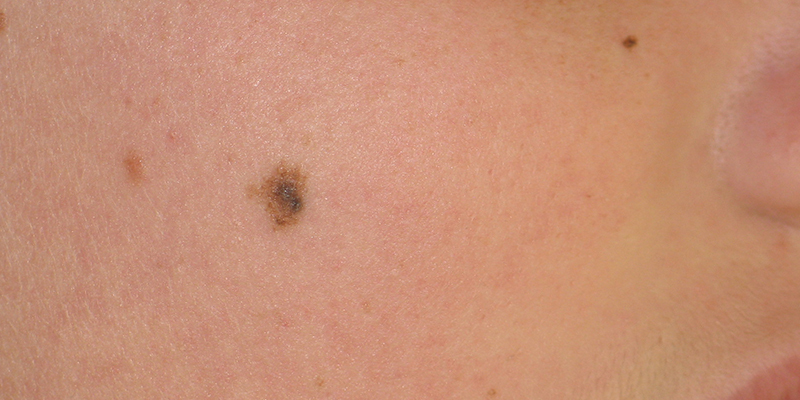 Melanoma-in-situ lesion may contain areas of invasive malignant melanoma. Frequently, this variability is visible with a naked eye and guides clinical decision making. The controversy arises when a biopsy is read as atypical melanocytic lesion with involved margins, and the pathologist recommends additional margin excision. From pathologist's perspective only a complete lesion removal allows for a definitive diagnosis. Complete excision of these atypical melanocytic lesions requires 2 mm margins around the visible lesion for complete clearance. Although most surgeons will not hesitate to excise these lesions completely, scientific evidence to support such approach is lacking. There little evidence that incomplete excision and subsequent lesion recurrence exposes the patient to a greater invasive melanoma risk. Furthermore, cosmetic considerations may be significant in sensitive areas such as the nose or eyelids. Additional 2 mm margins on all sides of the lesion can drastically change the reconstruction and the outcome. So, each patient and each lesion musts be treated with individual considerations and not necessarily rigid protocols. For in depth discussion of the risks of atypical nevi read this article.